we Boost’s Drive 4G-X is our most powerful, professional grade 4G vehicle booster. Commonly used by first responders throughout North America to boost signals while out on the road. The Drive 4G-X ensures that you get better voice and data with fewer dropped calls, improved voice quality, faster uploads and downloads, and allows up to 2 hours additional talk time in weak-signal areas. we Boost’s 4G-X boosts cell signals up to 32x and enhances 4G LTE and 3G signals for everyone in the vehicle whether it’s a car, truck, van or RV. Compatible with all U. S. wireless carriers including Verizon, AT&T, Sprint, T-Mobile, US Cellular, Straight Talk and more. All components needed for installation are included as well as simple instructions for a quick, easy setup. Plug the Drive 4G-X into the car’s power supply, place the magnetic antenna on the roof, and get better wireless signal on the road now. Using GPS or making a call, the we Boost Drive 4G-X Cell Signal Booster provides a stronger signal on the road. Hills, trees and distance from the signal source all affect call quality not to mention streaming services and GPS systems. The Drive 4G-X is your answer to all those times you’ve lost connection on the road. It offers stronger cellular connections by operating with the maximum output power allowed under current FCC regulations, extending your service range. 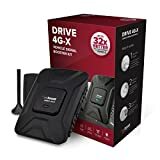 The Drive 4G-X substantially improves your cellular signal strength on all cellular-connected devices in your vehicle including smartphones, tablets and laptops.